Poverty Hides Amid Saudi Arabia's Oil Wealth Despite the luxury SUVs and upscale malls, poverty and unemployment affect millions in the country. It's a problem many Saudis are reluctant to acknowledge. King Abdullah has pledged billions in handouts and loans, but some worry the sudden rush of money won't fix the underlying problem. Saudi Arabia's oil wealth has contributed to its rapid economic growth and a reputation of extravagance. But the government and Saudi society are reluctant to acknowledge poverty in the kingdom. 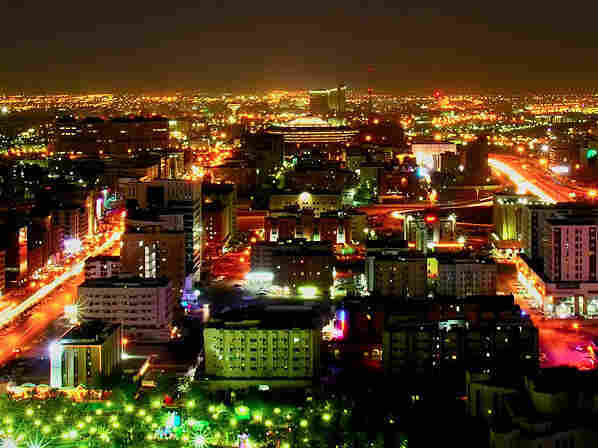 As an oil exporter, Saudi Arabia is one of the richest countries in the world. And with an economy that is continuing to grow, its reputation among many people in the Arab world is that of a nation of extravagance and, sometimes, excess. But when you look beyond the luxury SUVs, upscale malls and glittery high rises in the desert kingdom, a far different view of Saudi life emerges — one laced with poverty and unemployment, affecting millions of people. It's a problem many Saudis are reluctant to acknowledge. In the old section of Riyadh, the capital, Um Fahad pours roasted pumpkin seeds into a plastic shopping bag for a customer. She is one of about a dozen black-veiled women tucked away in tiny stalls at the end of a shopping arcade. Besides the seeds, Um Fahad sells cheap jewelry, embroidered shirts and small woven baskets. She says she and the others struggle to keep their meager businesses and families afloat. "Everything is getting harder. Prices are rising, like for these seeds," she says. "Business was better before. But it's not like I can stop working." Um Fahad says on a great day, she sells about $40 worth of merchandise. She says more common are the days when she sells nothing at all. The widowed mother of 11 says all of what she earns goes to feeding her family and to the rent for her stall and for her home. She also gets a few hundred dollars in charity once in a while from family and friends. But with her landlord planning to raise her house rent by about $100 a month, Um Fahad says she fears she will end up on the street. Her story is hardly unique in Saudi Arabia. Activists and analysts here say the widow is part of a growing class of impoverished Saudis who don't benefit from the country's vast oil and business wealth. They say women are especially at risk in this strictly segregated society, which prefers to limit a woman's role to stay-at-home wife and mother. Columnist Asmaa Al-Mohamed says being widowed or divorced can land even the richest Saudi women in poverty. With no skills and oftentimes no education, what money these women may have in the bank is soon gone. She adds that Saudi women who seek job training or to start their own businesses also face obstacles because of societal prejudices, despite a multitude of government-sponsored programs aimed at the needy. It's not just women who face hurdles. Some experts here say privately that all poor Saudis suffer because the government and society are reluctant to acknowledge poverty in the kingdom. The government does not routinely issue poverty figures, so it's hard to know how pervasive the problem is. The last figures, released more than three years ago, estimated there were nearly 670,000 poor families. Businessman Turki Faisal al Rasheed, who has written about Saudi poverty in articles and books, says that translates to about 3 million people, many of them from rural areas. "Three million is a lot. So when we're talking about Saudis are 18 million, that's a big percentage of Saudis [who] are below the poverty lines," he says. King Abdullah in late February shone a rare spotlight on struggling Saudis by pledging $37 billion in handouts and loans. Many workers here saw their salary double for one month. He followed up with a pledge to build a half-million homes. But Rasheed believes handouts don't offer a long-term solution to poverty in the kingdom. "One of the problems is denying the problem — that it doesn't exist," Rasheed says. "The second thing is like, just give the money away and go sleep comfortably, not to go through the procedure. Don't get me wrong, there is a lot of people who are doing a lot of work — very good work. But the problem is the need is much beyond what is being offered." Rasheed says the government and the private sector need to tackle Saudi poverty at its source — out in the countryside. His proposition: increase development aid and subsidize crops and small businesses in rural areas.